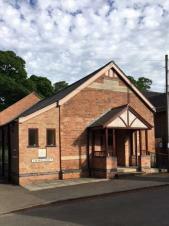 Located in Church Street adjacent to the Millennium Green Nature Reserve, the Belgrave Village Hall forms a focal point for village life by providing an up to date and comfortable venue. The Belgrave Village Hall is managed and maintained by the Belgrave Village Hall Committee. The hall is available for one off bookings, such as family parties and meetings, as well as regular classes. It has full kitchen facilities and is well equipped with tables and chairs. There is ample off-road parking at the rear of the hall.